urban chicken coop myths and tales: "mini-me"
There is something about miniatures that inspire awe, interest and curiosity. who doesn't love to see a shrunken version of familiar places, people and objects. I am fortunate to have a really talented person helping me out in the studio who happens to be a gifted artist himself. His specialty and obsession is making miniature versions of streetscapes, buildings and iconic or emblematic scenes that instantly evoke a sense of place. I thought it would be fun to commission him to do a version of my chicken coop studio. I had no idea what he would come back with and was stunned and overjoyed at the result. 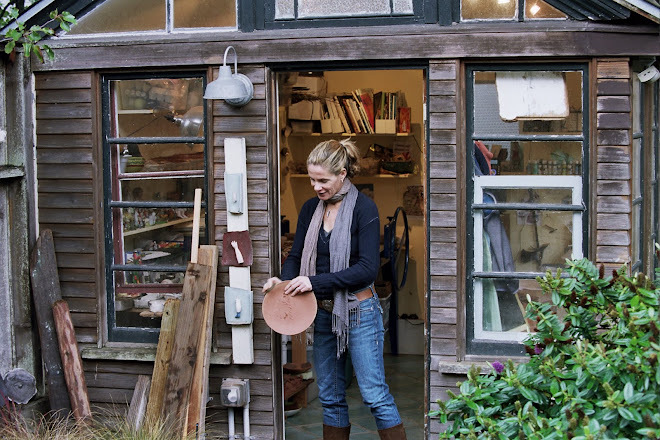 It truly is a "mini-me" of my beloved workspace..clay dust, objects, chaos and all.. I want to share some images of his creation along side of images of the real thing- every detail! the magazines, bags of clay, the ceramic tiled floor! he made each thing completely from scratch and scrounged materials..just brilliant!